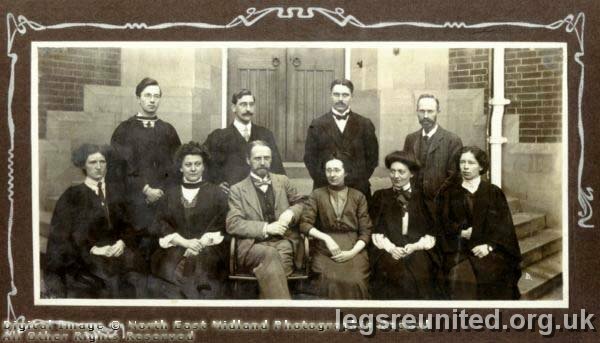 County Secondary School exterior - Headmaster Samuel Clegg (centre seated) and teachers. Circa 1910. BACK ROW L - R: Mr Walter George Culver (Physics), dks. FRONT ROW L - R: dk, Miss Turner (Biology), Samuel Clegg, Miss Evans (French? ), dk. Info re: the lady teachers from Norah Knight via Roger Graham March 2007.